Your welcome it was a good subject you brought up. The main thing is to get one and know how to use it. All is settled as far as In concerned if they want to play hide and seek I could go get bank trace but if it helped others because Hopefully he will refund the rest. Thanks for all your help Wanka and till now didn’t know how heated things got so hope people can move on from here. respective lawyers. I’ll have nothing to do with him. What a very touching and heartfelt message from Clint Eastwood. He made my day! If you realize each day is a gift, you may be near my age. Another thing: Participating in a gun buy-back program because you think that criminals have too many guns is like having yourself castrated because you think your neighbors have too many kids. Farmboy if it was a know for sure could trade a few pesos for dineros now at what 10 for one.? Well time to get up anyways can’t sleep your life away. Buygold it’s in Wankas hands now. He says he doesn’t have the records to ask Wanka so asked Wanka to email him and send him the check. Hope you do but please don’t count on it. goldielocks Yep, Been Hearing Rumors To That Effect For Several Years…. about Mexico going to silver coin for currency. Which is another way of saying they too may see the handwriting on the Dollar wall. That’s why I’m waiting till early August to see where it’s going near term. Read ” somewhere ” don’t know the validly of it Mexico is considering using silver to back the peso. If that goes thought that should be interesting. I doubt it but never know. I was not upset with your most thoughtful of warnings. My objection was to ‘twitchy nose’ attempting an air raid during my nap time. As a precaution, I have dispatched the appropriate Air Defense units. Thanks for the heads up, enjoy your Sunday evening. I think Monday will see a coordinated assault on the PM’s. Makes no sense with the Middle East problems. A little bird joined me during my nap today and whispered in my ear that the Israeli Consulate and Jewish Synagogues in Atlanta are upping their internal security teams and bringing in extra help. Doesn’t sound like there is to be an ‘peace talks’ coming out of that region anytime soon. Lil bird also mentioned, that the Israeli forces have been quite shocked at what they are finding with their little incursion. Hamas seems to have been much better equipped and stocked than thought prior to the ground roll out. And Hezbollah are expected to soon join the fray. I will use a 25 – 30 dollar smack down of gold in the morning as confirming my source. Update when FGC offered me a refund it was over a dispute going on about silverngold and something about a poster who was upset about his comments in the Newton shooting or if there ever even was a shooting being a inside job over gun control that since has came out in question understandably people were upset including me. Simone suggested during that time to get rid of him when he made no insults to anyone just posted his beliefs just as others understandably upset posted theirs. It was at that time FGC arrogantly offered me a refund. Do you remember that ? I think a lot of us were at the end of our robes with this abusive misgovernment. FGC has contacted twice ones asking where to send the check but smaller amount and told him to send it to Wanka I elected him as conservator. Then another telling me my name was not on the list during that time asked if I felt different politely in short. I told him I saw the list per Wanka did not see my name but under the circumstances would like to take him up on the offer of the refun of previous contributions. I havent heard back from him. I was just trying to give you a heads up! Just trying to be a good teammate after all my old teammates accused me of being a Buddy effer.! I shared my water, I gave morphine willingly to those injured, why would I not try to protect the good image of my friend Farmboy? Now, I’m not going so far as to say I would try to intervene in the wicked witches’ devious motives, but I did have a deep held personal obligation to at least send a warning signal! Sunday afternoon or early evening nap. I have heard tell of ceasefires declared even during war times that would honor this longtime held tradition. I am pretty sure that after a good Sunday Dinner it is one of the commandments that Noah or what’s his name wrote on a tablet of stone preserving a relaxing nap. Only the most evil of tormentors would dare interrupt such a soul soothing and restorative exercise. So there I was, daydreaming of hundred dollar spikes in gold and lily pads full of admiring frogettes when you went to hollering “Incoming !!”. Reminds me of another long time tradition. The one where the winning sports team dumps a cooler of ice water on the coach. I don’t guess even an impromptu ice bath could get me up and moving for shelter with the lightening speed generated by your post. It’s bad enough ‘she who flys’ has to mess with me during normal business hours, but this goes beyond all articles of war and just plain ole decent protocols. Not to mention manners. Frogs have feelings too. Very sensitive actually. And one should be aware of these feelings, even if you intend to serve me up on a plate for dinner. But I am ready for the dive bomber’s arrival. Next time she comes swooping down I am going to give her a reading lesson Farmboy style. At the end of her screaming Bonsai dive, I am going to hold up a book upon which she will impel her and that broom. I have the page about Sunday Nap Manners bookmarked for her perusal once she comes to. I wonder if the Library will accept my returned book with a few broom straws sticking out of it? Pays to be a card carrying member of the Frog Library. I try to drop by a couple times a week. One can never be too informed. Ps) Try checking that pile of coffee machine parts for that Eject button. Lord help me if ‘that woman’ ever gets hold of it. SR: I think $26/oz will confirm that the trend has reversed. If we exceed $26/oz on good volume and strength, then we’re off to the races. From there, the next resistance level would be $30–32/oz. If we reach beyond that level, it becomes $50/oz. And if we take $50/oz convincingly, then there’s a good chance that this move is going to have some serious legs. TGR: The Performance Report on SilverStrategies.com monitors 27 silver equities. Since early June, 26 of them are up, some more than 40%. June is typically a soft month for precious metals equities. What’s supporting those bids? SR: One thing is a possible top in the mainstream market. Another is that precious metals are up roughly 15% in the last month or so and stocks usually have an exaggerated move versus the metal price. And most of these stocks are coming off depressed levels. There was something of a vacuum so stocks tend to jump even on low volumes. Most of the sellers who wanted to sell did. On the flip side, it doesn’t take a lot of money to acquire a lot of stocks. Again, this behavior is typical for the beginning of a larger move. TGR: What are some small-cap silver names that you like in a rising silver price environment? SR: I like companies that have demonstrated growth, like SilverCrest Mines Inc. ($SVL:CA) ($SVLC) and Santacruz Silver Mining Ltd. ($SCZ:CA) ($SZSMF). TGR: What did you make of the Q1/14 results from Santacruz? Is the company poised to build on those? SR: Santacruz has stated its production numbers from the current operation and it looks as if it’s getting on track. Its production guidance indicates that, too. More important, the company has a lot of room to grow. It’s two years old. It’s already in production. Is it going to make it or not? Santacruz is almost over the hump. TGR: The company lost $0.02 a share in Q1/14. Will it break even or maybe even make money in Q2/14? SR: That’s not how I think about it at this stage of development. Most junior mining companies do not make money until their fifth or even eighth year. And in this environment very few companies have been making money. Unless it’s a larger company with established operations and better cost control, it’s difficult for a startup to pin numbers to something and say, “Okay, this is the benchmark.” Santacruz is not there yet. Do I expect it to make money this year? Maybe it will break even. But does it have upside? Yes. SR: SilverCrest is implementing a transition to underground mining at Santa Elena, which at full ramp up should nearly double production from the current level. So next year bottom-line numbers should get a substantial bump despite the higher mining and processing costs from moving to underground mining and milling operation. That should result in better valuation due to rerating based on the larger operation or at the very least on greater earnings. Now if I am correct about improving metal prices going forward, the upside could be very rewarding. Plus SilverCrest will almost certainly be active in the merger and acquisition space on either side of the deal. It could be a juicy target for a larger company while it looks to add another mine sooner rather than later. SR: Excellon Resources Inc. ($EXN:CA) ($EXLLF) is another company I’m watching. Excellon is a junior producer that has been around for a while and has a handle on its deposit’s cost structure and grade. TGR: How would you compare La Platosa in Durango state, Mexico, to other silver assets belonging to companies in this market-cap range? SR: It certainly is one of the higher-grade assets. In recent quarters Excellon has been mining 600–800 grams per ton (600–800 g/t) silver, whereas the average for Mexico would probably be closer to 200 g/t. However, La Platosa has had other challenges such as underground water issues, which factors into its costs. Excellon is still chasing the meat of the deposit; it has the tiger by the tail but it is still looking for the tiger itself. Excellon believes it is moving in that direction. In a rising metal price environment, such as the one I expect next year, higher grade may yield some oversized returns due to greater leverage to rising silver price. The gains could be significant. SR: Avino Silver & Gold Mines Ltd. ($ASM:CA) ($ASM) is producing around 1+ Moz silver equivalent a year. I have visited the operation and it looks good. The share price has reflected that, even in a poor environment for resource stocks. Avino recently acquired Bralorne Gold Mines Ltd, which owns a high-grade gold project in Canada. It is a bit of a departure from producing silver in Mexico. Can the company translate its success in Mexico to Canada? Time will tell. The other reason I like Avino is that it’s bringing the past-producing Avino silver mine back into production. That mine is in Mexico and is a stone’s throw from its current operation. That should basically boost production to about 2.5 Moz annually. TGR: What are some other silver equities with discoveries that could ultimately become company makers? SR: The last discovery of that nature would be the Navidad deposit in Argentina that was discovered by IMA Exploration and ended up with Aquiline Resources. Pan American Silver Corp. ($PAA:CA) ($PAAS) later bought Aquiline but mothballed Navidad due to the political situation in Argentina. In this cycle the best performers have not been the companies that made good discoveries but rather companies that have properly managed their resources and finances. Those companies have done well. Silver Wheaton Corp. ($SLW:CA) ($SLW) is on that list. First Majestic Silver Corp. ($FR:CA) ($AG), Endeavour Silver Corp. ($EDR:CA) ($EXK), Fortuna Silver Mines Inc. ($FSM) ($FVI:CA), and Great Panther Silver Ltd. ($GPR:CA) ($GPL) are on it, too. Most of those companies acquired their flagship mines. They were not discovery stories, though as part of good management most assets were expanded and their respective mine lives were extended through drilling success. TGR: Nonetheless there have been discoveries. SR: Yes. The Chinchillas deposit in Argentina was discovered by the same group that found the Navidad deposit, a Grosso Group company called Golden Arrow Resources Corp. ($GRG:CA) ($GARWF). Another discovery is Global Minerals Ltd.’s ($CTG:CA) Strieborná deposit in Slovakia. The project has been around a long time but the entire resource is based on a vein that was not exploited in the previous precious metals cycle. Global recently made another high-grade discovery, too. I mention a company like that because it’s in the heart of Europe. If we continue along this trend of increased geopolitical uncertainty, some silver deposits will become far more attractive than others. TGR: Let’s go back to your list of the best performers in this cycle. Names like First Majestic, Endeavour, Fortuna and Great Panther. SR: First Majestic is perhaps the best silver miner at this time. It is a classic mining story. It started with one mine, built it up and bought another one. And then built that up. Along the way the company made some discoveries or acquired other projects and built those up—that model seems to work well in the mining space. That’s been the path for many of the major gold producers. Ten years ago or so, Goldcorp Inc. ($G:CA) ($GG) was a one-mine company. But it bought other good assets and put them into production. Yamana Gold Inc. ($YRI:CA) ($AUY) used the same model to achieve similar success, albeit on a smaller scale. In the silver space that company is First Majestic. I expect it to get even bigger and better, much like Yamana. Bigger production means your bottom-line gets so much bigger so much faster in a rising metal price environment. TGR: Is it a similar narrative for Endeavour, Fortuna and Great Panther? SR: In a word, yes. All these companies acquired producing or past-producing mines and revived/improved/enhanced them over time. Endeavour Silver is another company that quietly built-up its production profile toward 11 Moz of silver equivalent, albeit the latter part of growth came from gold. Still at that rate of production Endeavour should respond well to rising gold/silver prices. Fortuna Silver has also been making headway with respect to its production growth closing in on the 8 Moz of silver equivalent. Fortuna has benefited from drilling success at its Mexican operation where high-grade intercepts allowed the company to ramp up both tonnes processed and ounces produced, which in turn reduces per ounce cost. Interestingly, Fortuna is currently valued at a premium to Endeavour despite producing in round numbers 3 Moz of silver equivalent less annually. This likely has to do with excitement regarding continued impressive drill results in Mexico, as well as the fact that Fortuna’s other producing mine is in Peru and therefore is not subject to increased royalty/taxes enacted in Mexico in 2014. Great Panther is one in the group that hasn’t accomplished a major push to get to the next level in terms of scale (not for lack of trying) and needs to do so. The company had its share of challenges at both operating mines and was able to overcome them. TGR: Perhaps one more silver name? SR: Tahoe Resources Inc. ($THO:CA) ($TAHO) is a relatively new silver company with what could be the best deposit in the space—the high-grade Escobal deposit in Guatemala. Tahoe is one of the larger silver producers, targeting 20 Moz per annum, and is very similar to Goldcorp in its earlier days. In fact, the people running the company and its flagship project came from Goldcorp. Tahoe has been in production for about two quarters and it is already making money. As was the case with Santacruz, it is a bit premature to talk about benchmark numbers in terms of performance, yet all indications point to a very successful future. As long as geopolitics hold together, this is one of the better deals in the sector. TGR: If silver rises in excess of $50/oz, many boats will float. How do investors sort out the pretenders? SR: You look back and see which companies were profitable at sub-$20/oz silver. If they are in the black, that’s an indication of how they run their operations. In the short term it is not a given that the “best” company will be the best performer. But overall, that would be a good problem to have. Money managers Doug Loud and Jeff Mosseri of Greystone Asset Management say that a bull market may have already begun in The Gold Report’s latest offering. The Gold Report: Over two days, July 14 and 15, the price of gold fell over $40 per ounce ($40/oz), more than 3% of its value. To what do you attribute this drop? Jeffrey Mosseri: I don’t think it was a very extraordinary event. Gold has been trading around $1,300/oz. We see sharp upward and downward movements triggered by, for instance, something Federal Reserve Chair Janet Yellen said or a negative report by Goldman Sachs. It looks as if gold will stay in the $1,300/oz range for a little while. We’ll see which way it breaks out. We believe it’s going to break out on the upside. Douglass Loud: Gold had been running up for a while, and every so often investors want to take some money off the table. 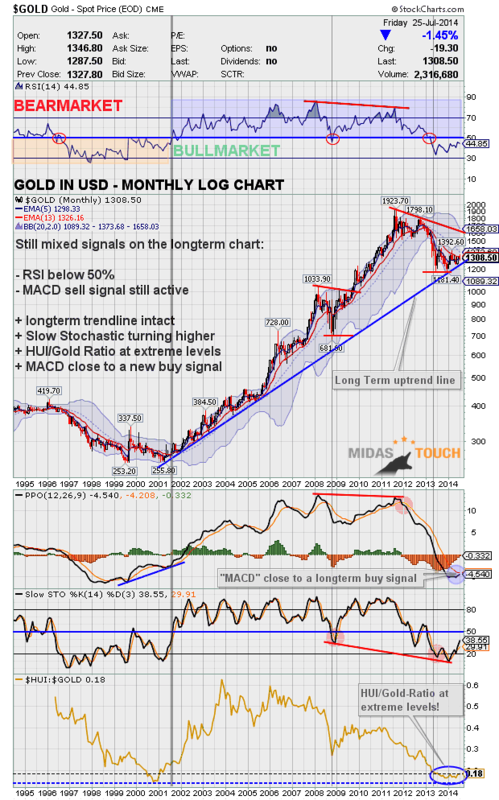 TGR: How high do you believe gold will go? JM: The average sustaining cost of production for gold is about $1,500/oz. If gold continues to trade below that level, at some point no new mines will be brought on. Supply and demand indicates higher prices for gold. At the same time, we’re dealing with a seasonal trading pattern. Usually the position for those commodities tightens up around September–October. We think this will happen again this year. Higher prices? Yes. How much higher? We don’t know. TGR: Given that the financing for junior gold companies collapsed years ago, shouldn’t the concomitant shortage of new supply have led already to higher prices? DL: Well, there are games going on. Every once in a while some big bank will say that gold is too high. Then it goes down. After that, some big bank will say investors should buy gold and gold goes back up again. Institutions can profit by shorting gold and then buying it back before it rises in price, or so the conspiracy theorist in me thinks. TGR: The world is becoming a more dangerous place. We have the civilian airliner shot down over Ukraine, civil wars in Iraq and Syria, Hamas attacking Israel, and Israel striking back, as well as a burgeoning territorial dispute between China and Japan. As a result, do you expect a flight to safety by investors? JM: Actually, we are flummoxed by the apparent disconnect between what’s going on in the world and commodities prices in general. We think that the reason for this is that the U.S. dollar is the least dirty shirt in the laundry basket. Investors are fleeing to the dollar because it’s easier and cheaper, but if these hot spots continue to get hotter, it will almost certainly translate into more gold buying. DL: Then there’s the issue of real gold versus paper gold. There may be much more paper gold than real gold to support that paper. TGR: The traditional argument for gold bullion is that it is a rare, real good that cannot be multiplied endlessly. Before gold exchange-traded funds (ETFs), if investors wanted exposure to gold that wasn’t in bullion they had to invest in mining stocks. Do you think ETFs have resulted in a substantially changed gold market? JM: For many years the traditional relationship between gold and gold stocks was that the stocks predicted the direction the metal would go. This changed with the introduction of ETFs, and for the last few years, the tail has been wagging the dog. The ETFs were an interesting introduction. They have been and will continue to be a very good way to play gold, but they did result in putting gold stocks out of favor. Now people are beginning to realize that it is the mining companies that produce the gold, and they’re going to make the profits. TGR: Historically, the end of a recession led to big increases in gross domestic product. We’ve yet to see this after the post-2007 recession. Why not? Are we now living in a new world of permanent low growth? DL: We’re supposedly out of a recession because a bunch of statistics say so, but tell that to the shopping malls that are one-third empty and to the people who don’t know how they’re going to pay for the increases in food and fuel that are no longer included in the inflation statistics. JM: Serious economic growth has been stymied by a rash of new regulations and by the standoff between Congress and the Obama administration. This disincentivizes capital investment and capital creation. Most of the stimulus money created from 2008 went to firm up bank balance sheets and did not get into the economy proper. And so the recovery has been a lot more anemic than in the past. Now, however, business loans are beginning to be made by the banks. Little by little this will percolate into the economy. And the $8 trillion ($8T) created by the central banks has to find a home somewhere. We believe this will be reflected in higher gold prices, and, in fact, higher prices for commodities in general. TGR: The Financial Times reported in June that public institutions, central banks mostly, have invested $29.1T in the markets, mostly the equity markets. JM: Well, because of continued very low interest rates, most of the stimulus has gone into improving bank balance sheets and into the equity markets but not into the economy proper. TGR: HudBay Minerals Inc. (HBM:TSX; HBM:NYSE) has taken over Augusta Resource Corp. and Osisko Mining Corp. was taken over by Yamana Gold Inc. (YRI:TSX; AUY:NYSE; YAU:LSE) and Agnico-Eagle Mines Ltd. (AEM:TSX; AEM:NYSE). Can we expect more such buyouts? JM: Yes. What’s interesting about recent takeovers is that they were initiated as hostile bids. This is very unusual for Canada, which is a much more gentlemanly arena than America, Britain or Australia. We believe it’s a question of value. Mining assets are now cheap, and well-financed companies can buy good properties cheaply. DL: We were in a meeting the other day with some executives whose company almost went under simply because their project took longer than expected. The company kept having to make payments on its equipment to keep its place in line, and pretty soon it used up all its cash. Time can kill a smaller business. And so mining companies can be bought on the cheap because they have no money and can’t raise it. TGR: The Osisko buyout has resulted in the creation of a new royalty company called Osisko Gold Royalties Ltd. (OR:TSX), which began trading at the beginning of June at $13.50/share and has since risen to $15.95/share. Why does the market value this company so highly? DL: Because it has a royalty on the Canadian Malartic gold mine in Quebec. So the company is like a mine without the mine. JM: Streaming companies are very attractive so long as they finance good projects. Investors see this stream of cash flow, and they love it. It’s less risk with more visibility. TGR: Osisko Gold Royalties has $157 million ($157M) in cash. How big a player does it intend to become? JM: Clearly it will be a major player. The question is, will it buy other existing streams or will it buy other projects that will stream later? I think it will do both. TGR: HudBay now has Augusta. Its Reed copper mine in Manitoba is now in production, and its Constancia copper mine in Peru is scheduled to begin commercial production in the second half of 2015. How do you rate this company? JM: Very positively because we see its production going up radically in 2014–2015. Copper production should increase by over 50% next year. We happen to be very positive on copper. We also think HudBay will increase its gold production. And Augusta may not be its last acquisition. TGR: How likely is it that HudBay will be able to move forward its newly bought Rosemont copper project in Arizona within a reasonable amount of time? JM: All these big projects come down to two things, permitting and financing. The financing part should be easier. We think HudBay will move it along at a good pace, and that it will overcome any permitting hurdles. DL: Otherwise, there would have been no point in HudBay buying it. TGR: How ambitious is HudBay? How big does it want to be? JM: HudBay has extremely good management and will operate within its financial constraints. Other than that, I think the company will grow as big and fast as it can. Talking of permitting, after 10 years, we feel that Polymet Mining Corp. (POM:TSX; PLM:NYSE.MKT) is very close to obtaining its permits and its financing, and will finally be going into production on its huge copper-nickel deposit in Minnesota. TGR: The Reed copper mine is owned 30% by VMS Ventures Inc. (VMS:TSX.V). After VMS pays back HudBay and the cash flow from Reed begins to accrue, how transformative will this be for VMS? DL: The cash flow will be very helpful, but the company shouldn’t run out and make any acquisitions tomorrow. It’s going to take a while for it to receive actual cash from that project versus accounting entries of cash flow. We like some of its other projects. One of them is in Greenland, and that’s very interesting, but it is Greenland. TGR: You’re referring to the fact that VMS owns 22% of North American Nickel Inc. (NAN:TSX.V) and its Maniitsoq nickel sulfide project in Greenland. Rick Mills told The Gold Report that he thinks the world of this project and that VMS was quite clever to get a piece of it. TGR: In a previous interview, you talked a fair amount about Yukon mining. Are you still keen on that region? DL: Yes. There are those who feel that expenses went through the roof, which they kind of did, but we still like some of our companies up there. For instance, Alexco Resource Corp. (AXR:TSX; AXU:NYSE.MKT)and its Eastern Keno Hill Silver District. The company is run by some really smart guys. For example, Alexco used to pay Air Canada about $600,000 yearly to fly its workers in and out. It has solved that problem, and it has gotten other costs under control as well. Additionally, there’s a lot of zinc up at Keno Hill, and if zinc comes back, it will be a very profitable project. When I was in the Yukon a while back, someone told me jokingly that the Yukon ought to annex northern British Columbia (B.C.) because it was more like the Yukon than B.C. There are a lot of good projects in that region, like Pretium Resources Inc. (PVG:TSX; PVG:NYSE), with its huge high-grade gold discovery that’s just waiting to be taken advantage of. And there is Western Copper and Gold Corp. (WRN:TSX; WRN:NYSE.MKT) and its Casino project, which is going to produce copper at a very low cost. Any company that can accomplish this will do very well because the need for copper isn’t going to go away. TGR: What is the status of Alexco’s Bellekeno silver mine? DL: I think it’s coming along very nicely. And Alexco has found a wonderful new site called Flame & Moth. Unfortunately, it’s right under the mill it just built, so it is building the entrance to this new mine right next to the mill. The company will have two major production areas going. If it produces, for the sake of argument, 3 million ounces (3 Moz) of silver a year, it could well do 6 Moz of zinc. In addition, Alexco has its environmental recovery division. There are an awful lot of big companies that have bought a lot of little companies over the years, and they’ve got a whole bunch of little mines that maybe weren’t cleaned up the way they should have been. Alexco is poised to profit from that. TGR: Which gold juniors do you like in Nevada? DL: We’ve always liked Midway Gold Corp. (MDW:TSX.V; MDW:NYSE.MKT) and its Pan project because it’s plain and simple. You take it out of the ground and put it on the pad. I also like Paramount Gold and Silver Corp. (PZG:NYSE.MKT; PZG:TSX) because it owns the Sleeper gold project. It was hugely successful before and could be again. JM: We also like Allied Nevada Gold Corp. (ANV:TSX; ANV:NYSE.MKT). TGR: Midway just closed a $27.5M bought-deal financing. Pretty good for a junior these days, no? JM: It is and speaks well to the probability of it getting into production and cashing in. TGR: Moving on to South America, are you still fond of Exeter Resource Corp. (XRC:TSX; XRA:NYSE.MKT; EXB:FSE) and its Caspiche project? DL: We still like Exeter a lot. TGR: From June onward there has been a rather significant appreciation in its share price. JM: That’s because Exeter pared back its Caspiche project from a major copper-gold porphyry, whose capital expenses would be around $4.5 billion ($4.5B), to a $200M capital expense (capex) oxide-only project, which stands on its own two feet and should be very profitable. Then, if commodity prices rise enough to attract capital for large projects once again, the underlying porphyry will still be there for further development. TGR: What else interests you in South America? DL: Because of the government of President Cristina Kirchner, Argentina has rather taken itself off the grid. If she is replaced with a more mining-friendly leader, then we like Yamana, which bought Exeter’s Cerro Moro project. We would also revalue McEwen Mining Inc. (MUX:TSX; MUX:NYSE ) and Goldcorp Inc. (G:TSX; GG:NYSE). JM: A better regime would also benefit Barrick Gold Corp. (ABX:TSX; ABX:NYSE) and Pan American Silver Corp. (PAA:TSX; PAAS:NASDAQ). TGR: Argentina has been troublesome for business ever since Juan Perón first came to power in 1946. Does there come a point when mining companies decide to write off a country once and for all? JM: In the end, greed trumps grief. DL: And don’t forget the grades in those Argentine projects are extremely high, which should make them very profitable. TGR: The current bear market in precious metals goes back to April 2011. When will it end? JM: We think it may have already ended. The recession has cleaned out a lot of doubtful companies. The survivors with really good projects will either be bought out or get financed. We think that’s going to start to happen in the very short term. TGR: How long will the trend have to keep moving upward before we can say that we’re now in a bull market? JM: Metal stocks did extremely well from 2002 to 2010. Then there was a correction. We think that we are preparing for the next upward move, which should last for several years. There is a tightness in various metal markets, which will mean higher metal prices. This could lead to more mines going into production in the future. TGR: When you consider your favorite companies, which qualities do they share? JM: Good, solid management is one. Good deposits and good grades are another, and either being in production or being close to production is a third. To all who are using or thinking of using Colloidal silver. Mike at Life Force sent me this in depth information and just emailed me saying it’s okay if I post it so I’m going to. This is long and one very important point in the amount of PPMs recommended during certain times of the year or perhaps using both depending on the environment which you live as some PPMs work better for some things as far as the amount or PPM. Just spotted this woman flying over my hills! Not saying you should be worried but I did misplace the button. buygold we have a major big comeback in the making…all 2 bucks!